NEED MORE INFORMATION ON EZZY SAILS DESIGN THEORY? The Color Fusion Tri-lite has a strong polyester scrim combined with an X ply insert. The scrim consists of closely space yarns running in the warp and fill directions. 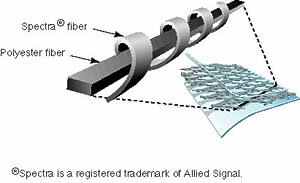 Having these closely spaced yarns makes the stretch balanced in the warp and the fill directions and also improves the UV longevity, since there aren't large "windows" of film that could crack from UV exposure. The X ply insert also provides extra bias support and improved tear strength. It has always been a quandary how to get a neat color design in the sail cloth. To date there has only really been screen printing as an option. Screen printing is messy, toxic and not permanent. Next came Pryde with a new way of adding color by printing the inside of the film first, before lamination. This involves running the film through an offset printer, much like what you would use for printing a magazine. Then, laminating the cloth with the print on the inside. The problem with this is that you are laying down ink that has a weak bond to the film, then you are gluing to the ink while laminating. The lamination strength is only as strong as the weakest bond, and that happens to be the ink. So, down the road, it is quite likely there will be delamination issues with the this process. Our Color Fusion cloth was the idea of Kenneth Madsen at Dimension Polyant. I have been working closely with him to perfect it. 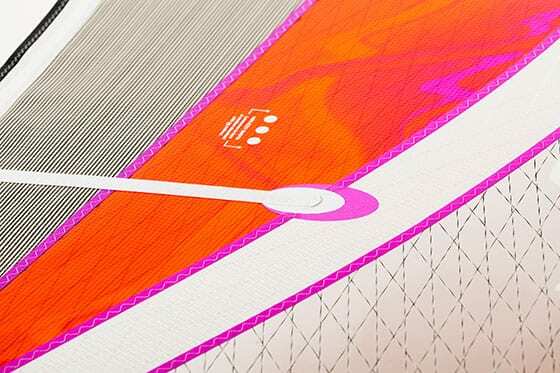 With Color Fusion, the color pattern is achieved by applying colored adhesive during the lamination process in the same way that the clear adhesive would be applied in a standard lamination. The result is a super strong lamination and a beautiful random color pattern that is unique for every sail. No two sails are the same. The color fusion cloth looks truly amazing when the sun shines through it. Strong and light: weight for weight, Technora is 8 times stronger than steel and 3 times stronger than fiberglass, polyester or nylon yarns. Shows little loss of strength even during repeated abrasion, flexing and stretching. Stiff and highly oriented molecular structure leads to a high modulus of elasticity, low creep and low stress relaxation. Low thermal shrinkage, i.e., excellent dimensional stability. Thermal decomposition threshold of 500ºC, so Technora can be used at 200ºC for long periods. At 250ºC, it maintains more than half of its room-temperature tensile strength. Highly resistant to acids, alkalies and organic solvents; not vulnerable to damage caused by steam or sea water. 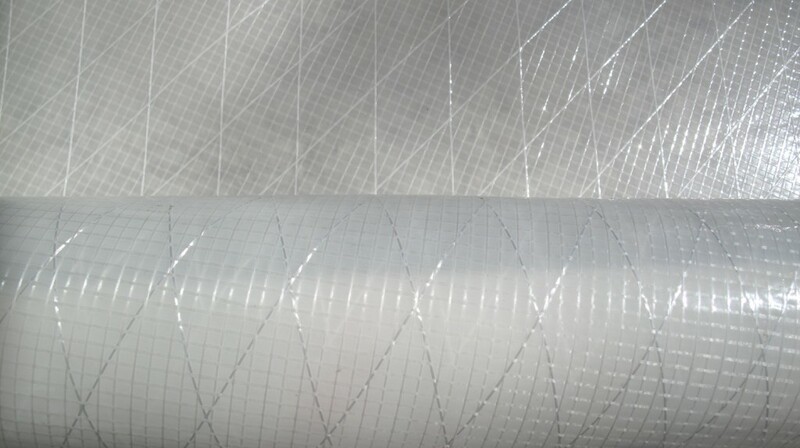 The Tri-Lite consists of a closely space woven polyester scrim and X ply that is laminated with thin film on both sides. The overall weight is about 40% less than monofilm. The tear strength is much better than standard X ply because of the combination of scrim, X ply and the thinner film. The Tri-Lite also has 2 to 3 times better UV strength because the thinner film does not get as brittle as thicker films do when baked in the sun. Our Spectra® X-Film, with its super-tough Spectra® Yarns laminated between two layers of film, has 1,000 times stronger tear strength and better UV resistance than monofilm. 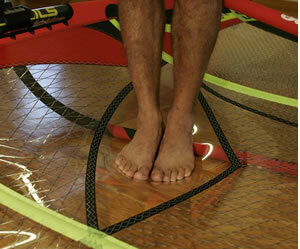 David Ezzy’s own triaxial rip-stop film that now sets the standard by which all other sail materials are measured. The new x-ply laminate material utilizes a Spectra® yarn. 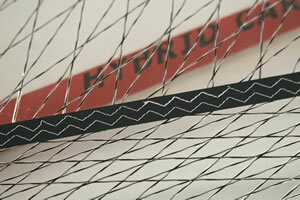 Braided with a polyester filament, in a wide triaxial grid, the results are astonishing. Due to the wider grid pattern, this material weighs less than our previous x-ply film, thus reducing the sails’ overall weight. A benefit to surf sailors and swell riders, the Spectra laminate also offers improved visibility and five times the rip-stopping power of traditional x-ply laminate films. 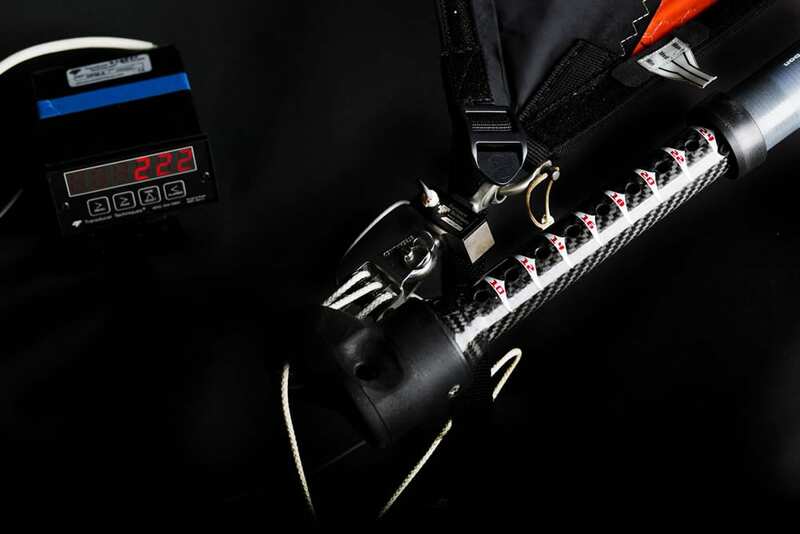 This has resulted in a revolutionary material which boasts an unprecedented strength-to-weight ratio. 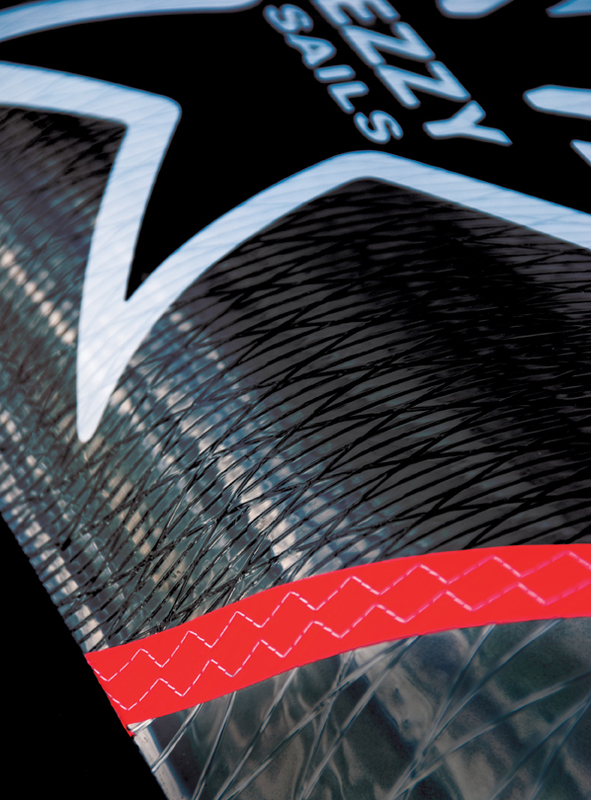 The Spectra® laminate film is found in the Ezzy Wave Special Edition, the Ezzy Infinity, and the Ezzy Eagle Kids Sail. Vinyl is a super durable material that is very hard to puncture or rip. Other sail companies a monofilm window that will fog up due to exposure to the sun. 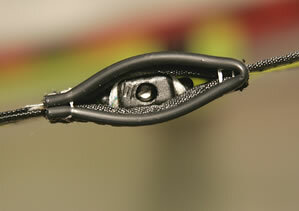 Monofilm is much easier to puncture or tear with your harness hook, knees or head. The Ezzy Special Edition Wave and Eagle series sails feature vinyl windows. The shaping in our sails is done in every panel along with the luff curve. There is shape in every panel and every panel overlaps to create a batten pocket. Doing this we can make the draft in the sail move forward. Other company’s sails, the draft moves back when you sheet in. This creates a constant pull on your backhand. 10 months out of the year we are designing, making and testing prototypes for the next year’s sails. We make almost a sail a day. Other companies make 1 sail a week or every two weeks. 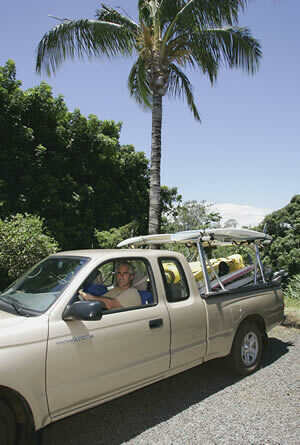 We test our sails in a variety of conditions on Maui. We are constantly trying new ideas and materials to make our sails better than the rest. Every Ezzy Sail is assembled by David Ezzy’s own factory. This means the quality control is set up to his exacting standards. Every sail is rigged before it leaves the factory to make sure every seam is flawless. When the sails are being made in the factory, every one is rigged and checked for quality.